It turned out that it’s not as easy as it looks to style an element to behave like that. The difficult part is the fact that the progress bar is flat, but fits nicely in the rounded corners of the containing shape. As it turns out, there are some bugs in Webkit and thus Chrome and Safari when it comes to the clipping of child elements of elements with rounded corners, that make it hard to get this to look like in the picture. I finally found a creative solution. If you’re just interested in the source, check out the demo page. Otherwise, do read on! Furthermore, I wanted this to be flexible. That means no fixed-width images or other “cheats”; CSS only. The most obvious solution for this was to build the progress bar from two nested divs: one to represent the whole item and then one to represent the progress. We give the outer div a width and a fixed height to keep it simple, but with an absolutely positioned inner div, it could just as well have a dynamic content size. The result looks great in Firefox, but looks broken in Chrome and Safari, due to the aforementioned bugs. WebKit does not properly clip the content to the parent’s rounded outline, so it ends up looking rather awkward. Although the solution with the nested div looks exactly as intended in Firefox, it doesn’t really hold well on WebKit due to the lack of proper clipping. Perhaps something can be done to work around the bugs and make it look good anyway. Dropping the rounded corner on the right hand side makes it look good, but only when the bar is more than X pixels wide and more than X pixels away from the right corner (otherwise it would still clip there). By now, it’s obvious that this is a dead end. Clearly we need a workaround that does have proper clipping. As it happens, such a workaround exists. While reading about clipping nested elements with rounded corners, there was one solution that kept popping up. A common problem is to have an image with a caption wrapped inside a div with rounded corners. This is then solved by removing the img-tag and setting the image as a background to the rounded div instead. It’s an old solution, that can even be done automatically using jQuery. It works, because even when rounded corners do not clip the contents of an element, they do affect the background. This turned out to be the key to the solution. There we have it! This works in all browsers that support rounded corners and degrades nicely in those that don’t (I’m looking at you, IE 7 and below). There are some caveats. 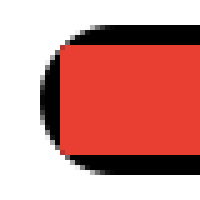 First of all, due to the way image backgrounds work, a background-width of 0% still results in a 1px wide red bar. Therefore, the image background actually starts 1px to the left and goes to 101% instead of 100%. More importantly, we are now using an image to style the background. This has two big drawbacks: firstly, the image requires an extra request to the server to be made, slowing down the loading of the page. Secondly, an image is arguably less flexible than a purely declarative CSS solution. Note that this does not work on IE7 or below, so be sure to add a fallback to support those. The flexibility part can actually also be solved this way, but that is something for another time. That’s all! Using an overlapping background-color and background-image, we can make a sharp-looking rounded progress bar and avoid those maddening clipping bugs. Of course the real solution lies in a cross-browser method to apply rounded corner clipping to child elements, but until then this gets the job done. For the full source and the ability to see the progress bars animate live, check out the demo page.